MCKINLEY PARK — For 18 years, people have been telling Joe Trutin that his little Archer Avenue video store would be going out of business any day now. "I have a philosophy about that, that everybody's going to tell you that you're doing everything wrong. But only a few people will tell you you're doing it right," said Trutin, owner of The Video Strip at 3307 S. Archer Ave.
And his customers — some 10,000 store members over the years — tell him he's doing something right. 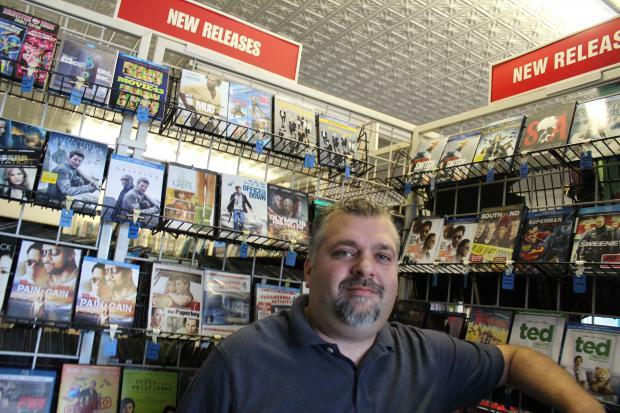 Trutin, who's worked at a half-dozen video stores across the city, said he saw the demise of video chains years before it materialized and decided to go it alone, opening his little independent shop in what was then an industrial stretch of McKinley Park. He stocked it with VHS tapes and a whole bunch of brand new discs called DVDs. And still everyone thought he was nuts. But Trutin, 39, said he's made it a success by offering what the big chains couldn't and what streaming services like Netflix and Amazon Instant Video can't: a huge selection paired with real, live recommendations and customer service. "A computer can't find the movie for you before going through some sort of algorithm to say 'You should like this.' But a person is able to say, 'If you liked this, then you should like that,'" he said. "And we're more than happy to tell people a movie sucked." The relationships forged among movie buffs were celebrated at Saturday's International Independent Video Store Day, which pays homage to the "stores owned and staffed by human beings who can be relied upon for reviews and recommendations and who truly love what they do." Unlike some of the city's other independent video stores that survive by specializing in certain genres — think places like Odd Obsession in Wicker Park for far-out rarities and Ashburn's soon-to-be-closed 79th Street Video for animation and martial arts — the Video Strip specializes only in carrying a little bit of everything. An avid observer of movie industry trends, Trutin said he believes membership-based streaming services like Hulu and Netflix won't kill his brick-and-mortar business. Production companies, movie studios and cable providers remain locked in a battle for America's entertainment dollar, and big-money contracts between some studios and Netflix are beginning to expire, resulting in Netflix recently yanking 1,800 titles from its streaming catalog. "I've been warning everybody that you won't be able to get this stuff for five bucks a month," he said. Video Strip has a number of rental options, ranging from a kids-movies-only plan for $4.99 per month to the $19.99 all-you-can watch plan, which includes video game titles. It's a formula Trutin thinks can work, even as new streaming services enter the market. "Everybody laughs at us again," he said. "But hey, I'm here." The Video Strip, 3307 S. Archer Ave. is open noon-midnight daily. A special Halloween deal — any six horror titles for $6.66 — is in effect through the rest of October.